Hundreds of Kurds who live in Diyarbakır’s Sur district face imminent eviction by the Turkish government as the site will reportedly undergo reconstruction to repair destruction caused by fierce clashes between Turkish security forces and the Kurdistan Workers’ Party (PKK). According to tweets posted by the HDP and several different pro-Kurdish Twitter accounts, hundreds of police and security force members set up barricades around the city to prevent people from going to their homes. Sur, which has been inscribed as a UNESCO World Heritage Site, was subject to round-the-clock curfews from the start of December 2015 as security forces tried to remove PKK militants from the urban center. The Silopi and Cizre districts of Şırnak province, also in the Southeast but closer to the Syrian and Iraqi borders, have also been under on-and-off curfews since mid-December. Security forces removed 329 improvised explosive devices within Sur alone. The Turkish government announced in late March 2016 that 18 neighborhoods of the Sur district were to be expropriated under a Cabinet decree. 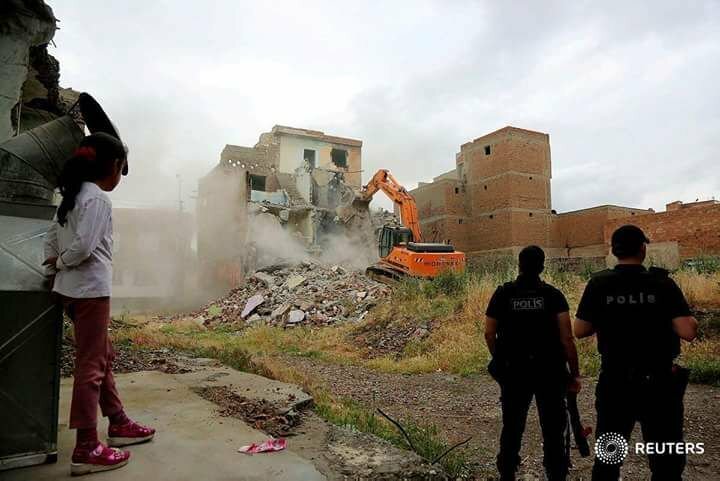 The immovable properties at 363 locations around Sur were transferred to the Ministry of Environment and Urban Planning as the buildings in 18 neighborhoods of Sur will be demolished to make way for new ones. Those who own land or property within the expropriated zones of Sur will be paid in installments. 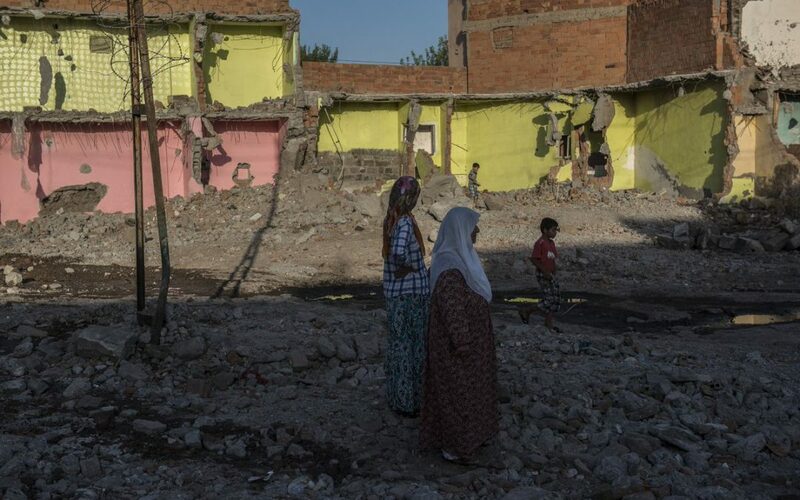 In an urgent call to action on June 29, 2017, Amnesty International said that hundreds of residents in the Alipaşa and Lalebey neighborhoods in the Sur district are at imminent risk of forced eviction, urging the Turkish government to halt the evictions. “Since 23 May, during the fasting month of Ramadan, water and electricity supplies to residents’ homes were cut off in an apparent attempt to force them out,” the statement said, adding that they were earlier subjected to round-the-clock curfews due to clashes ongoing from December 2015 to March 2016. Many historic structures in the Sur district have been damaged due to the combat, such as the Dört Ayaklı Minare (Four-Legged Minaret). The famed minaret is a tall tower standing on four columns and serves as the single minaret for the adjacent Şeyh Mutahhar Mosque, built in 1500; the minaret is believed to be even older than the mosque. Sur is one of the southeastern districts that witnessed the most violent clashes between Turkish security forces and the PKK. A long-lasting curfew imposed on the district has recently been partially removed. The curfews along with the clashes paralyzed daily life for locals in Sur, where many had to leave their homes. Turkish security forces have been trying to clear southeastern towns and cities of PKK terrorists since last July, when a two-year cease-fire collapsed, shattering a settlement process launched by the government in late 2012 to end Turkey’s long-standing Kurdish problem, triggering the worst violence in two decades. The Turkish Human Rights Foundation (TİHV) said in a January report that, as of Jan. 24, at least 198 civilians including 39 children have died in combat areas under curfew since August 2015. According to media reports, more than 300 members of the security forces have been killed in clashes in the region. Birgün Surlu bir kadın olun. YIKIMLAR VE YENİDEN YAPILANMA NEYİN HAZIRLIĞI.